You know the expression that an apple a day keeps the doctor away (as long as that apple is pesticide free, non-GMO and organic)? I thought I’d modernize the saying by adding the criteria in parentheses. Anyways, if that is true, then my personalized application of said theory may have lead me to stumble upon the recipe for immortality. 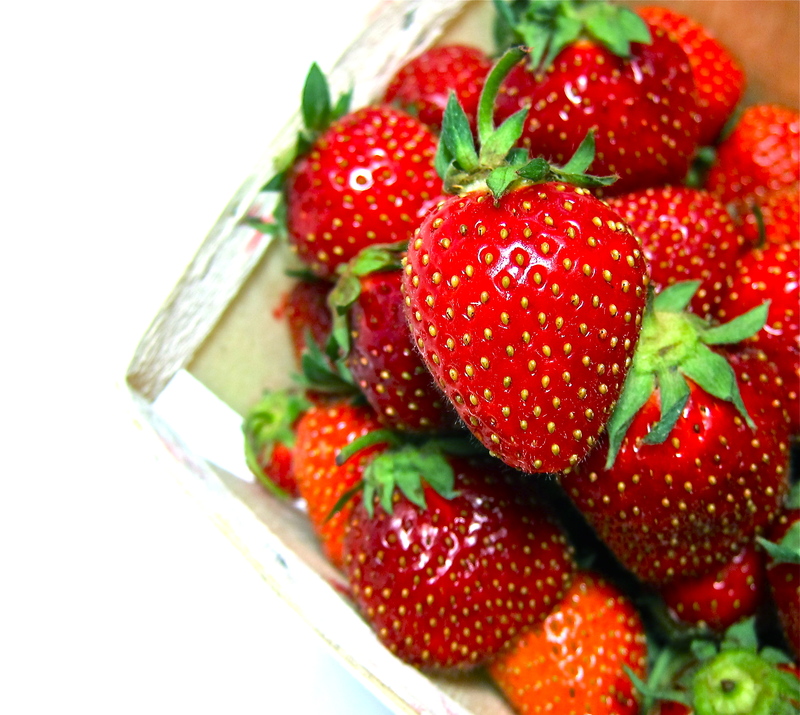 I’ve eaten a pound of strawberries every morning for the last three weeks- not including additional tantalizing pints of blue or black berries that may have been consumed during the remainder of each day. That’s right. A pound. Yeah. I go a little “fruity” over the summer. 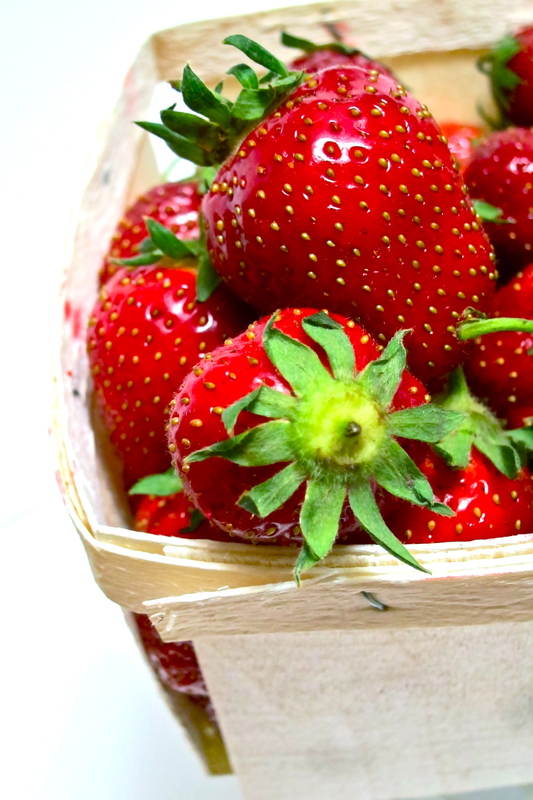 What do you expect when the dazzling bounty of summer’s sweetest gifts only comes around for a few months a year? Am I to suddenly decide that summer is the time to monitor my portion sizes? Heck no! There’s always…well, I guess if you take out Christmas season…and Thanksgiving season…and my birthday month….well… that always leaves February 26th of each year to worry about such shenanigans. I seem to obsess each year over a different fruit. Two years ago it was juicy, chunky cantaloupe and last year was when I flung myself into a relationship so hot and heavy with regally golden-fleshed mangoes that I think I’ve single-handedly driven scurvy extinct for everyone in the Chicagoland area. However, there is a down side to such overindulgence. And perhaps the deadly sin of gluttony has indeed had the last word because the following year I seem to develop a bit of an aversion to my chosen fruits due to overconsumption the previous year. There has been no romantic mango tango this year as there was last year. Not-a-one. 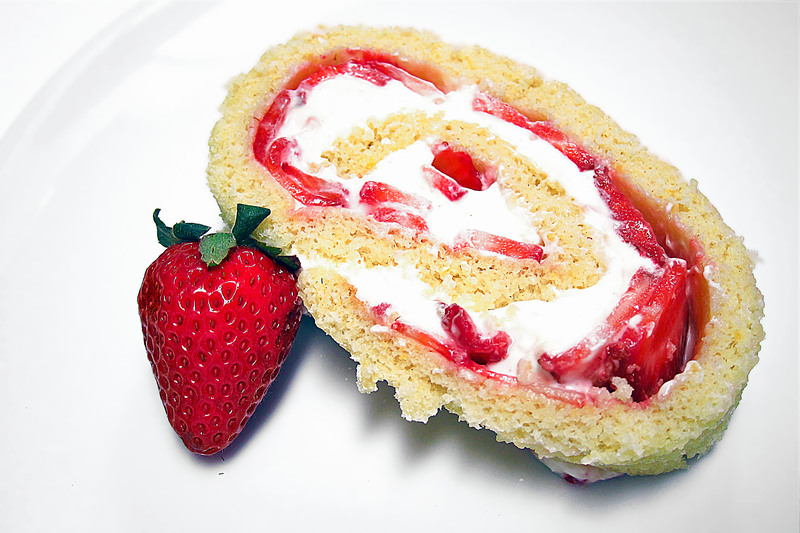 …Strawberry Cheesecake Jelly Roll Cake. Yes, it is necessary to include both “cake” descriptors. The first one to let you know that a creamy, tangy cream cheese flavor is to be anticipated, and the second is to inform you that it will not be in the typical form of a brick-o-cheesecake. This impressive cake is rolled, showing off its intricate whirl of cheesecake whipped cream, ruby red strawberries and delicate golden sponge cake. Soft and light, you can get your strawberry cheesecake fix in the form of a pinwheel of airy deliciousness. Easy breezy batter settles into the penthouse suite of pans. Pamper your cake with a warm towel spa treatment. Decorate your cake with glistening berries. Whip up a tangy topping. Hide the jewels in creamy sweetness. A gentle roll makes it all make sense. 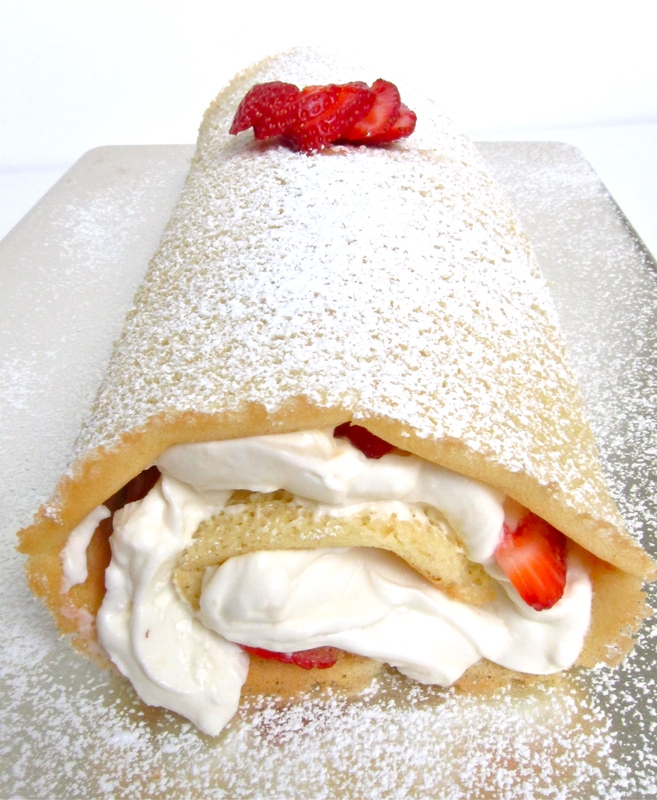 Tangy, sweet cheesecake whipped cream fills the gaps in a rolled vanilla sponge cake lined with thin slices of ruby red strawberries. All the satisfaction of a strawberry cheesecake wrapped up in an airy yellow cake minus the feeling of a five pound weight in your stomach. This is one fancy shmancy beauty perfectly suited for center stage at your summer party. 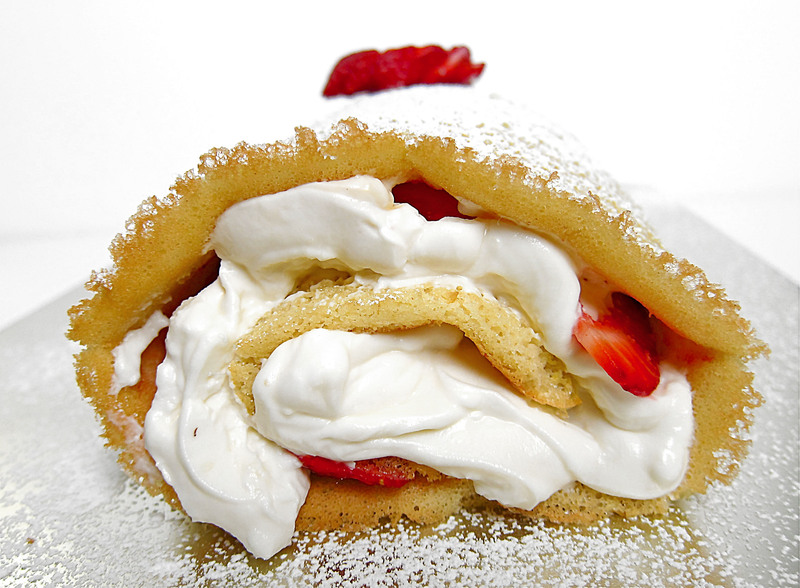 Use an electric mixer to whip the cream cheese, sour cream, lemon juice, vanilla and 1 C of powdered sugar together. 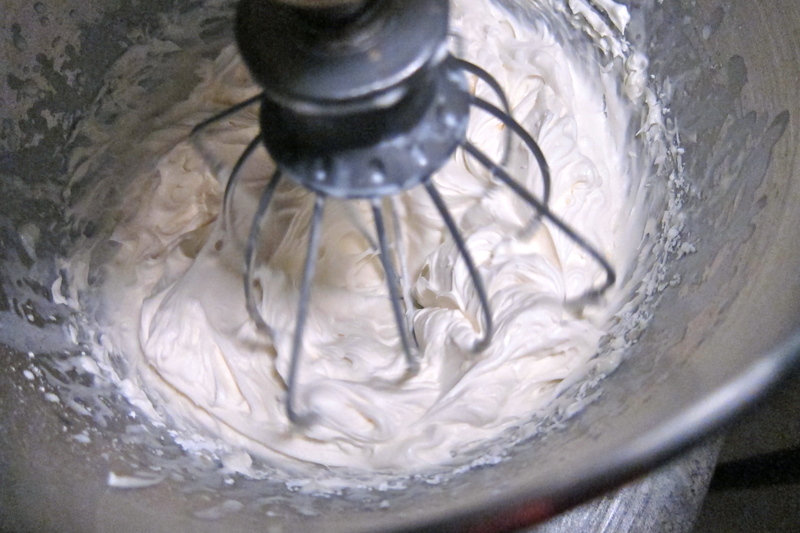 When all combined and smooth, add heavy cream and whip on high speed until the volume begins to rise. Add final 1/2 C of powdered sugar and whip until slightly stiff and creamy. 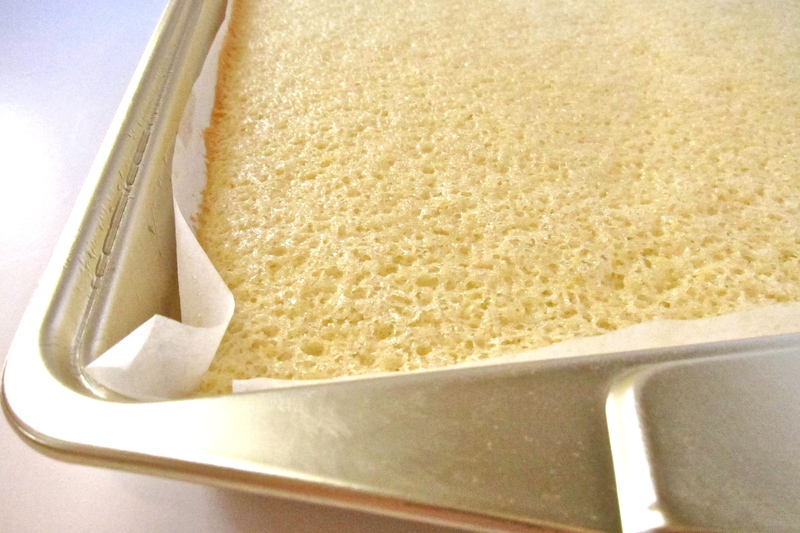 Preheat oven to 375 F. Spray a jelly roll pan with non-stick spray. Line it with wax paper and then spray it again. Ready a clean towel about the same size as the pan. Beat together the eggs, water, sugar and vanilla until light in color and slightly frothy. Pour the batter into the prepared pan. 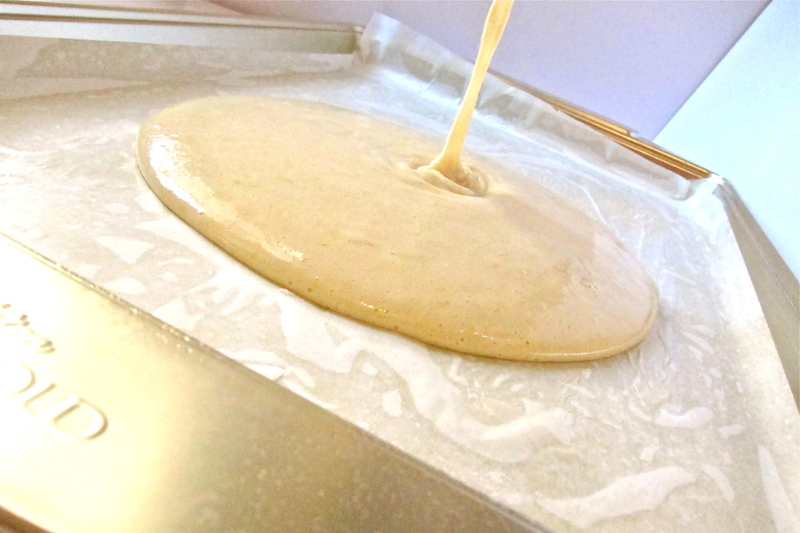 Don’t worry, it is enough batter for the cake! Bake in preheated oven for 8-10 minutes until just golden brown on the edges and cake springs back when you press your finger gently on its surface. Remove from oven and put cake top side down onto your spread out towel. Peel off the wax paper. 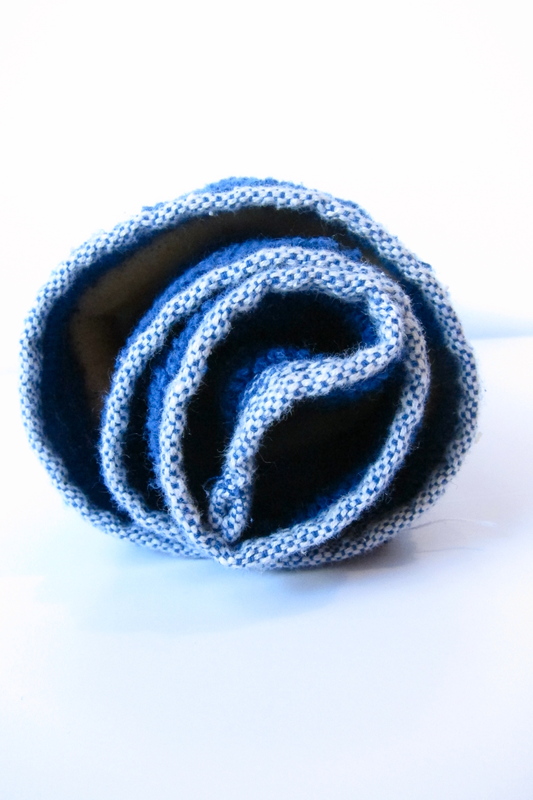 Starting at one of the short ends, gently roll the towel and cake together completely. 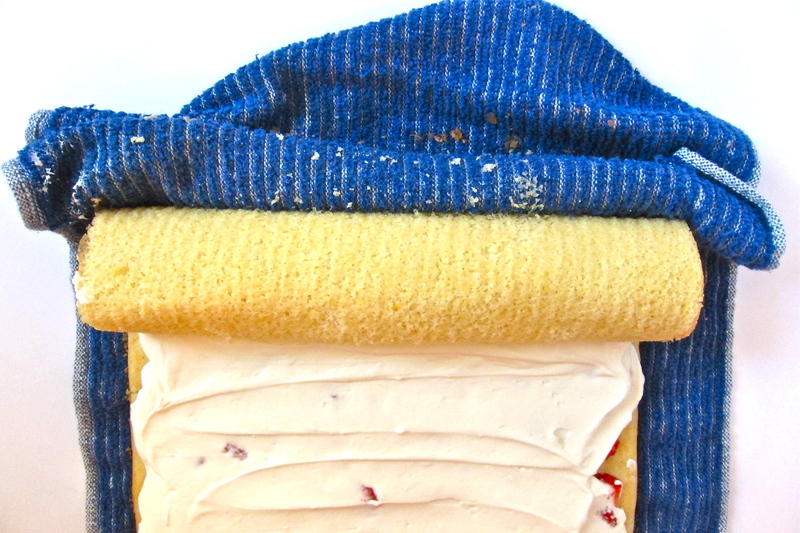 Place cake, rolled up in the towel, on a rack to cool. When cooled, carefully unroll the cake. 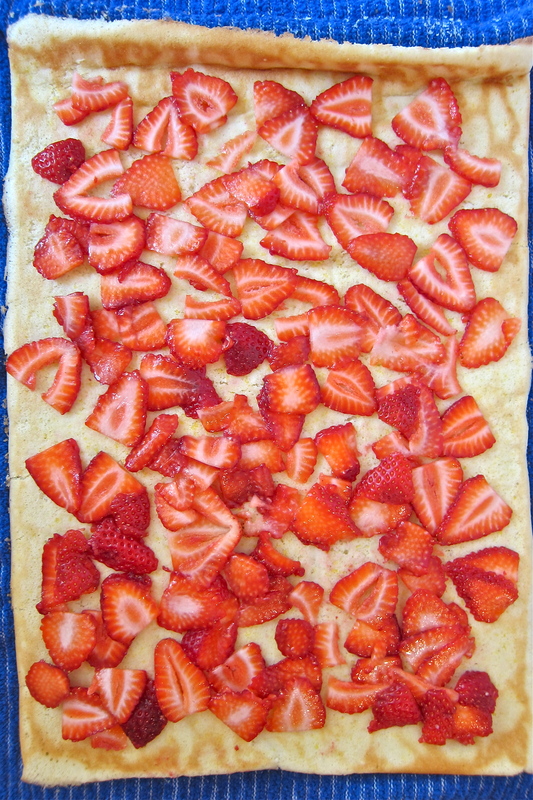 Top the cake with the thinly sliced strawberries to cover the surface completely. 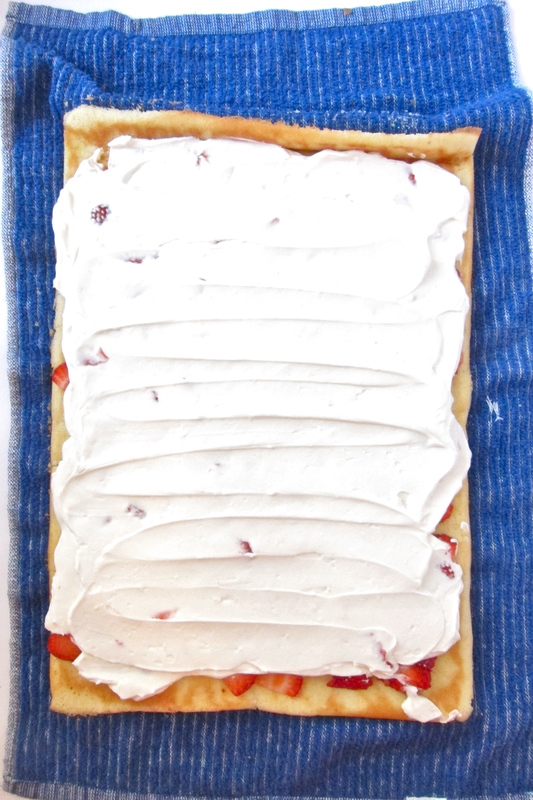 Then carefully spread the cheesecake whipped cream over the strawberries. Slowly roll the cake back up (this time without the towel). Place cake on a serving platter and dust with powdered sugar. Serve immediately or refrigerate 1-2 hours then serve. Enjoy! 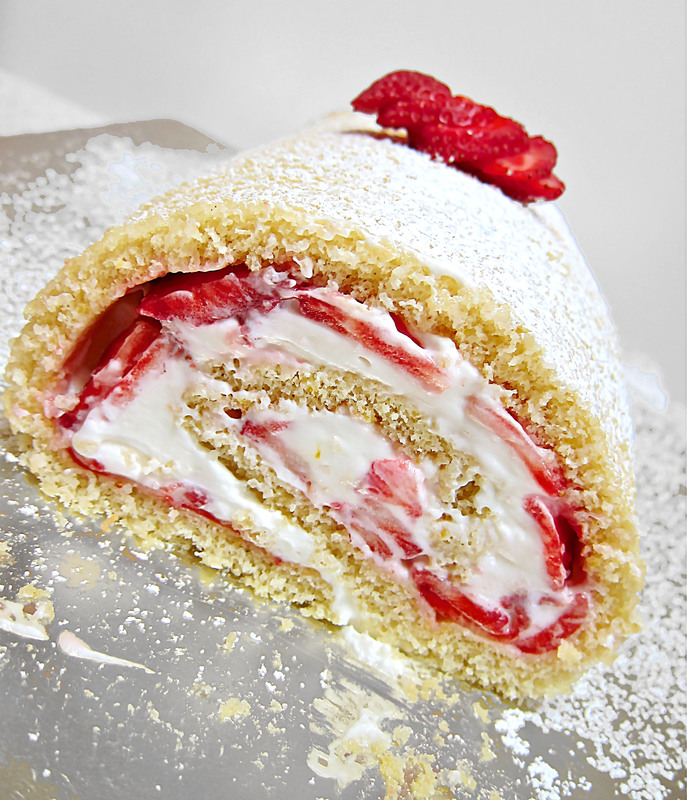 This entry was posted in cake, cheesecake, recipe and tagged jelly roll, jelly roll cake recipe, jelly roll recipe, roll cake recipe, strawberry cheesecake cake, strawberry jelly roll cake, strawberry jelly roll cake recipe. Bookmark the permalink.